Welcome to the The Hampshire Golf Club Online Tee Time Reservation Service. This service allows you to book a tee time at our golf course online and get instant on-screen and email confirmation of your booking. Click here to book a tee time on the The Hampshire Golf Course. Click here to book a tee time on the The Hampshire FootGolf Course. 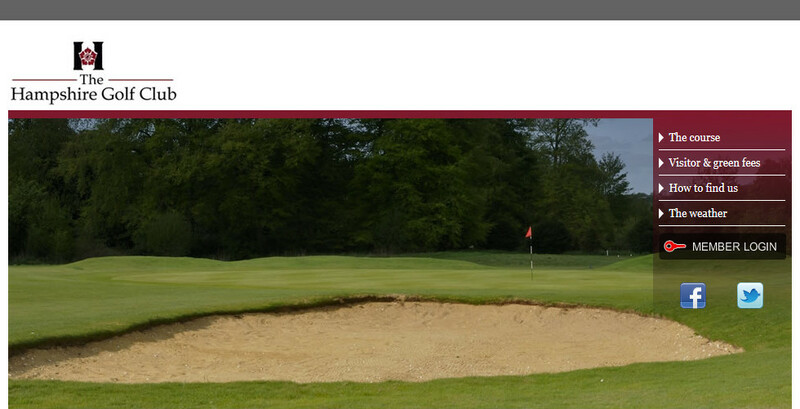 The Hampshire Golf Club Winchester Road Goodworth Clatford Andover Hampshire SP11 7TB Registered Office - as above. Company number - 03314191 Email address - golf@thehampshiregolfclub.co.uk : Tel. 01264357555 TERMS AND CONDITIONS: These are the terms and conditions for booking tee times using our Internet booking facility. Payment ======= Payment will be taken at the time of booking in GBP and will appear on your statement as 'Kitchen Angels Ltd'. To book a tee time online you will have to enter your credit or debit card details using our secure online payment process. You should print off or make a note of your booking reference as this will be required on your arrival at the Club. Refund / Cancellation Policy ============================ If we have to cancel a booking due to adverse weather conditions and other conditions beyond our control, we will offer a free rescheduling of your golf play to a date or time of your choice subject to availability. You can cancel your booking by contacting The Hampshire Golf Club by email, events@thehampshiregolfclub.co.uk or telephone, 01264357555. Please remember your booking details will be required to confirm the cancellation. Failure To Cancel Your Booking ============================== If you fail to cancel your booking, there will be a charge of 100% of the green fee made to your credit/debit card in GBP. Booking Transferable ==================== The Booking is completely Transferable. Therefore, should you be unable to make your tee time, you can offer the tee time to someone else such as a family member or friend. Handicaps ========= This facility is only available to golfers who have a handicap of 28 or less (men) or 36 or less (ladies). If you don't have a handicap, you must be able to play to an equivalent standard. Dress Code ========== Normal GUI/ILGU dress code applies. The following are therefore not permitted: denims, shorts, football/rugby tops. Spikes ====== Spikes may be worn. directly by phone on 01264 357555.